Role: Defender, Striker. A melee striker and defender, they shift between dealing damage to the damned and defending their allies from the injust. They are as much guardians as they are crusaders of justice. Power Source: Divine and Martial. Crusaders employ basic, martial attacks, that are enhanced by their divine vigor and will. Trained Skills: Religion. From the class skills list below, choose 3 more trained skills at 1st level. Characteristics: The crusader is a predominately melee striker and defender who uses divine powers and seals to enhance melee basic attacks. They don't gain daily powers, but do gain a scaling Encounter power and possess a number of augmentations for their melee basic attacks, as well as inherent abilities. They gain an extra Utility power at level 2, 6, 10, 16, and 22. They also gain access to an additional Seal at level 11 and 21, and additional Judgements and Glpyhs at level 7, 13, and 23. They are an essentials-style class, but differ in some ways. Religion: A divine protectors of justice, they are heavily inspired by religion. While some are strong believers of their faith, others see it more as a means to an end, or only pay partial reverence to the Gods. Others still are more agnostic or Atheistic, and pay homage to the "Divine Light" of creation, and respect all living creatures and morality. While all crusaders are inspired by their faith, not all are inspired by Good. While all Crusaders believe their righteous, moral crusade is for the betterment of mankind, many Crusaders stray from the moral path, and grow to worship dark, or evil Gods. This Crusaders often believe themselves to be doing the right thing, but are authoritarian or ruthless in their execution. All Crusaders are uncompromising in their convictions, and this extremism can lead to the darker side. Strength should be your primary ability. As almost all of your powers and attack rolls utilize strength for the attack and damage roll, strength should be the primary ability, and 20 strength at character creation is recommended for power characters or strikers. However, wisdom is extremely important, as well. Virtually all of your secondary powers use wisdom, and many of your secondary damage roles use Wisdom. Wisdom is almost as important as strength, although some builds can get away with lower wisdom levels. 20/16 or 18/18 is recommended. 20/14 or 18/16 are plausible, albeit weaker builds. Crusaders emphasize durability and power. Feats which boost your defenses, such as toughness or improved defenses, will naturally augment your high defenses. Damage feats, such as weapon proficiency or expertise feats, should not be neglected, especially if you are going a more striker oriented route. Feats built for the Crusader should be considered, as should racial feats that are particularly powerful, such as Dwarven Weapon Training. As you are a heavy armor dependent class with secondary abilities that do not boost lightly armored defenses (such as dexterity or intelligence), you should start with the highest armor you can, or plate. Choosing heavy shields or two-handed weapons will be your biggest choice; if you want to do more damage, you should go with two-handed weapons, which also can receive additional benefits with certain powers. As all of your melee attacks can substitute your enhancement with your implement bonus instead, and your minion attacks will be dependent on your implement bonus, it is wise to choose a magical holy symbol. Otherwise, standard adventuring gear is suggested. When you wear or hold your holy symbol, you can add its enhancement bonus to the attack rolls and the damage rolls of powers that have the implement keyword. You can also add its enhancement bonus to the attack rolls and the damage rolls of weapon attacks you make using a weapon with which you have proficiency. You can also use a weapon with which you have proficiency as an implement. When wielding the weapon as an implement, the weapon's characteristics-proficiency bonus, damage die, and weapon properties like defensive or high crit-are irrelevant to your implement powers. If you have both an implement and a magic weapon, you choose before you use an attack power whether to draw on the magic of the implement or the weapon. Your choice determines which enhancement bonus, critical hit effects, and magic item properties and powers you can apply to that power. You can't, for example, use the enhancement bonus of implement and the critical hit effect of your magic weapon with the same attack. Crusader's use melee basic attacks for most of their attacks, and generally modify them in order to do extra damage. Seals and Auras in general are passive benefits that always provide your character with a bonus, where as Blessings, Lending Hands and Judgments tend to be situational. Crusaders function as either Strikers or Defenders, capable of using a mixture of both to increase the damage of their attacks or increase their defending abilities. 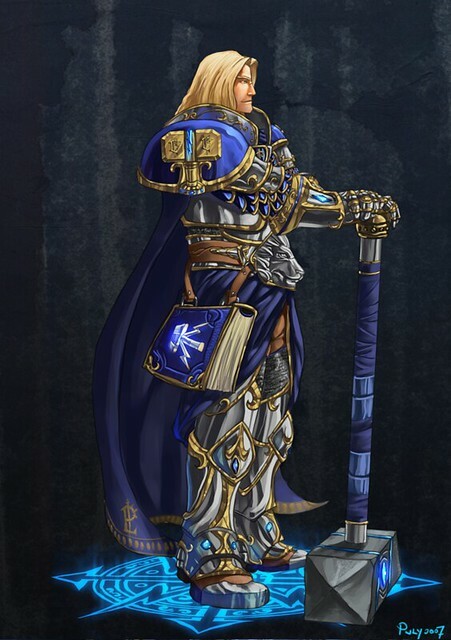 Crusader's possess a wide variety of special abilities, and can function mildly as leaders. Crusader Melee basic attacks gain both the Martial and Divine keyword, but still use strength for the attack and damage rolls. When wielding a weapon, you gain a +1 bonus to all attack rolls. You gain an additional healing surge. In addition, you can use your second wind as a minor action to heal an ally of your choice within 5 squares of you. If you do so, you gain no benefit from using your second wind, but the ally regains hit points equal to his or her healing surge value. You gain access to divine Auras. Divine Auras are auras that augment your character in innate ways. The Defender aura causes a -2 penalty to allies who don't target you and allows for opportunity attacks, as normal defender auras do. The other three auras effect damage, allow you to reduce your allies damage, and heal your allies. You gain access to the Defender Aura, Devotion Aura, Crusader Aura, and Sanctity Aura. While you have access to all 4 auras, you can only have 1 aura active at any given point in time. At the start of combat, you can activate one aura for free; when you roll for initiative, you can choose to activate one aura as a free action. After this, you must activate the Auras normally. Seals are your basic attack abilities, similar to stances in the essentials rulebooks. However, Seals are not stances. While active, Seals provide some kind of benefit which usually modifies your melee basic attacks or movement in some way. They often provide extra damage or effects, and can even heal your allies. While you have access to multiple seals, you can only have 1 seal active at any given point in time. At the start of combat, you can activate one Seal for free; when you roll for initiative, you can choose to activate one aura as a free action. After this, you must activate the Seals normally. At level 11, you can increase the amount of seals you know by one, and by level 21 you can increase the amount of seals you know by one, again. Glyphs are points that can be expended when in use with certain powers. They mostly are used for Blessings, Lending Hands and Judgments. As you level, the number of glyphs you have per encounter increases. Glyphs can be used with other powers, such as utility powers, but are not always. You regain a glyph each time an attack of yours results in the death of a non-minion enemy. You can only get one glyph in this manner, per turn. Furthermore, these glyphs are lost at the end of an encounter. At level 1, you start each encounter with 2 glyphs. At level 7, you start with 3 glyphs. At level 13, you start with 4 glyphs. At level 23, you start with 5 glyphs. You gain access to Blessings. Blessings are special modifications that boost your allies powers in some way. Blessing usually require a glyph to activate, and generally can only be used once per encounter. They provide a powerful, static benefit that lasts for the entire encounter. While they vary in effect, all blessings provide extra bonuses to your allies in some way, that remain with them as you play. Only one blessing of any type can be used per encounter. At level 21, this increases this 2 blessings per encounter. You gain access to Lending Hands, which are similar to Blessings. Lending hands are special modifications that provide a boost to your allies in some way. While the effects of the powers varies, they consume a glyth to activate ,and generally can only be used once per encounter. They provide a powerful benefit to a character, which lasts for a variable length of time. Only one Lending Hands of any type can be used per encounter. At level 21, this increases to two blessings. Judgments are essentially attacks that consume a Glyph to activate. While not as powerful as encounter powers, they provide an additional bonus to a melee basic attack, to augment them in some way. This can range in effect from dazing the enemy to making the attack a close burst 1. You learn 2 judgments at level 1, and 3 at level 7, 4 at level 13, and 5 at level 23. Crusaders gain access to Auras, Seals, Judgments, Blessing, Hands, and Crusader's Strike. Benefit: You gain all of the following powers at level 1. You may only have 1 aura active at a time. At the beginning of an encounter, you may activate an aura for free, or when you roll an initiative check. You focus on defending your allies, exhibiting a radiance of sheer protection. Effect: You activate an aura 1 that lasts until you end it as a minor action or until you fall unconscious. While in the aura, any enemy takes a -2 penalty to attack rolls when it makes an attack that does not include among its targets either you or an ally of yours who has this aura active. Marked enemies are not subject to this aura. You embody the presence of sheer devotion, exuding an aura healing all those around with the blessing of the Gods. Effect: You activate an aura 1 that lasts until you end it as a minor action or until you fall unconscious. While in the aura, all allies regain hitpoints equal to your wisdom modifier. You exude the raw presence of a Crusader, filled with the conviction to destroy the wicked. Effect: You activate an aura 1 that lasts until you end it as a minor action or until you fall unconscious. While in the aura, enemies take a -1 penalty to all defenses. You consecrate the ground around you, sanctifying the earth itself. Effect: You activate an aura 1 that lasts until you end it as a minor action or until you fall unconscious. While in the aura, allies takes 20% less damage against all attacks. Battle Guardian While an ally is subject to one of your auras, you can use the "Battle Guardian" power. You act with argent fury, rushing to intercept an attack. Trigger: An enemy subject to your Divine aura either shifts or makes an attack that targets an ally of yours, but not you or an ally who has an active defender aura or Divine Aura. Effect: You can make an opportunity attack against the triggering enemy. Benefit: You gain two of the following powers at level 1. At level 11, you gain access to one additional Seal power, and at level 21 you gain access to one more additional Seal power from the list below. Seals are essentially your melee basic attack modifiers, similar to stances in essentials classes. They are your primary damage augmentation modifiers. You are imbued with the will of the Crusader, bent on the path of destruction. Effect: You gain the "Seal of the Crusader". Until the seal ends or you change the seal, you gain your wisdom modifier bonus +2/3/4 as extra damage when you make melee basic attacks. At level 11, the bonus increases to double your wisdom modifier. You exude an aura of blood, striking your enemies with righteous fury. Effect: You gain the "Seal of Blood". Until the seal ends or you change the seal, you gain a +1 bonus attack rolls and a +2/4/6 bonus to damage rolls when you make a melee basic attack. You enter a state of righteous fury, quick to condemn all who cross your path. Effect: You gain the "Seal of Fury". Until the seal ends or you change the seal, you gain a +2/4/6 bonus to damage rolls of melee basic attacks when you charge. On a successful hit, you can knock the target prone. In addition, you can shift 2 squares as a move action during your turn. You cripple your enemies with the all encompassing, weight of justice. Effect: You gain the "Seal of Justice". Until the seal ends or you change the seal, when you successfully hit a target with a melee basic attack it is slowed and takes a -1 penalty to all defenses until the end of your next turn. You seek vengeance for your allies, protecting them from harm. Effect: You gain the "Seal of Vengeance". Until the seal ends or you change the seal, you gain a bonus to opportunity attack and damage rolls equal to your wisdom modifier. Further, an enemy struck by your opportunity attacks stops moving; If it still has actions remaining, it can use them to resume moving. You exude the aura of Command, your raw presence insisting on control of your enemies. Effect: You gain the "Seal of Command". Until the seal ends or you change the seal, when you successfully hit a target with a melee basic attack it takes a -2 penalty to all attack rolls until the end of your next turn. You are the righteous hand of God, his loyal soldier, a man who will not kneel. Effect: You gain the "Seal of Righteousness". Until the seal ends or you change the seal, when you successfully hit a creature with a melee basic attack, one creature adjacent to etheir you or the target takes damage equal to your wisdom modifier. When you miss with a melee basic attack, the attack does damage equal to your wisdom modifier. You take heed in the spirit of the light, imparting it's healing touch on your allies. Effect: You gain the "Seal of Light". Until the seal ends or you change the seal, when you successfully hit a target with a melee basic attack your or an ally with 5 squares of you either regains hitpoints equal to your wisdom modifier, or gains temporary hitpoints equal to your wisdom modifier. All shall be revealed and judged, under the weight of the truth. Effect: You gain the "Seal of Light". Until the seal ends or you change the seal, when you target a creature with a melee basic attack you can choose to target the fortitude defense. In addition, one ally within 5 squares of you gains a +1 bonus to their AC until the end of your next turn. Your natural intuition and insight, in to the spiritual planes, grants you power. Effect: You gain the "Seal of Insight". Until the seal ends or you change the seal, when you successfully hit a creature with a melee basic attack, you gain a +1 bonus to all defenses until the end of your next turn. You can also shift 3 squares as a move action. Benefit: You gain two of the following powers at level 1. At level 7, 13, and 23, you gain access to one additional judgment power of your level or lower. Judgments consume a Holy Glyph in order to be used. Judgments can be use no more than twice per encounter, regardless of how many judgments you have. While you can use as many judgments as possible equal to your number of Glpyhs, you can only use individual powers twice per encounter. You can only use 1 Judgment power per turn, regardless of how many Holy Glyphs you have remaining. You strike with the blinding power of justice, it's crushing blow dazing your enemies. Effect: When you successfully hit a creature with a melee basic attack, that creature is also stunned until the end of your next turn. Special: This power consumes 1 holy glyph. In addition, you can only use this power twice per encounter. For the wicked, there is no greater fear than the reckoning. Effect: With your your next melee basic, your reach increases by 2. On a successful hit, the target is immobilized until the end of your next turn. You consecrate the ground around you, imbuing it with holy power. Effect: Each enemy in the burst takes damage equal to your wisdom modifier. You wield the long arm of the law, reaching beyond the bounds of mere mortal men. Effect: When you make a melee basic attack, you can choose for the attack to gain the ranged property with a range of 5. On a successful attack, the target is slowed. The target does not provoke opportunity attacks for being ranged. You selflessly sacrifice yourself to heal others, and aid your allies. Trigger: You hit a creature with a melee basic attack. Effect: One ally can regain hitpoints equal to your level + your wisdom modifier. Vengeance is among the most moral pursuits of justice. Effect: You deal extra damage to the target equal to your strength modifier. You preserve the sanctity of battle, ensuring your enemies follow the same command as the light. Effect: The target is blinded until the end of your next turn. You strike with such fury, your enemy revels in awe of your conviction. Effect: The target takes a -2 penalty to attack rolls and is dazed until the end of your next turn. Benefit: You gain all of the following powers at level 1. Blessings consume a Glyph in order to be activated. Blessing provide a benefit to the target, which usually lasts until the end of the encounter. Only one blessing can be used per encounter, regardless of how many Glyphs you have. At level 21, this increases to 2 blessings. You impart the blessing of might upon an ally, increasing their strength. Effect: The ally gains a +1 bonus to attack rolls and a +2/3/4 bonus to damage rolls until the end of the encounter. Special: This power consumes 1 holy glyph. You bestow the blessing of Kings, providing the general goodwill and health they receive. Effect: The ally gains 5/10/15 extra hitpoints and regeneration 1/2/3 until the end of the encounter. You offer sanctuary to all those in need of protection. Effect: The ally gains a +1 bonus to all defenses until the end of the encounter. In addition, when you are adjacent to the ally or a creature making an attack against that ally, all attacks take a -2 penalty to attack rolls if the attack does not include you. You impart the wisdom of the Gods, granting them with indellible vision. Effect: The ally gains a +2 bonus to all skill checks until the end of the encounter. In addition, the Ally vision and hearing is never disrupted by any means, they can ignore concealment and total concealment, and they cannot suffer from the blinded or deafened condition. They are also immune to the dazed, dominated and stunned condition. You impart the blessing of the Light, allowing it to empower your allies. Effect: The ally gains a +2/3/4 bonus to all all damage rolls, resist 2/4/6 to all damage, cannot suffer from the blinded or deafened condition, and their vision and hearing is never disrupted by any means. Benefit: You gain all of the following powers at level 1. Hand powers consume a Glyph in order to be activated. Hand powers provide a benefit to the target, which usually last for a short period. Only one hand power can be used per encounter, regardless of how many Glyphs you have. At level 21, this increases to 2 hands. There is no more liberating feeling, than when feeling for the first time, the hand of freedom. Effect: Until the end your next two turns after you've activated this power, the ally gains extra damage to all their damage rolls equal to your strength modifier. You make the sacrifice, protecting your ally from harm, by shifting it to yourself. Effect: Until the end your next two turns after you've activated this power, you can choose to take all the damage the ally would ordinarily take. You provide an aura of protection, a seal, glowly radiantly around the ally, absorbing the harm that may befall them. Effect: Until the end your next three turns after you've activated this power, the ally takes half the damage from all sources of attacks. You extend your hand with salvation, offering penance for all who simply reach out and take it. Effect: The ally can re-roll the roll and take the highest of either result. Until the end your next turn, the ally can re-roll any dice roll and use the higher of either result. You remove the impure, curing your allies of all their ailments. Effect: The ally can choose to loses all effects or end all ongoing conditions or ongoing damage that they possess. Until the end your turn, they are immune to all harmful conditions. Benefit: You gain access to the "Crusader" Strike power. Like the "Power Strike" power, you gain extra uses of the power and deal extra damage with it as you level. You gain an extra use of this power at level 3, 7, and 13. You strike with holy vengeance, confidently attacking your enemies with your Crusader's will. Effect: The target takes 1[W] extra damage from the triggering attack. This increases to 2[W] at level 13, and 3[W] at level 23. Note: You gain an extra use of this power at level 3, 7, and 13. You gain access to the Paladin Utility powers, including those found in PHB1 and Divine power, in addition to the following. Benefit: You can choose one of the following powers below or a Paladin Utility power of the same level. You are blessed by the gods, giving you the chance to heal your allies. Effect: You may perform one First Aid action with the healing skill. You cleanse your ally of any ailments or disease. Effect: You immediately end one ongoing effect on the creature that a save can end, or the creature achieves an automatic success on any endurance roll related to poison or disease. Your conviction knows no bounds, granting endless vigor. Effect: You enter the "Boundless Conviction" stance. While in the stance, you gain a +4 bonus to all saving rolls, and you are immune the effects of fatigue, hunger, thirst or suffocation, and no longer have to sleep. This stance ends at the end of the encounter. You briefly flash a divine light, allowing for a rejuvenating effect to invigorate the target. Effect: The target regains hitpoints equal to your level + your wisdom modifier. If the target is healed to full health, the excess hitpoints granted by the power are gained as temporary hitpoints. You are blessed by the gods of war, to fullfill the role of a true Guardian. Effect: You assume the "Gaurdian's Favor" stance. Every time you deal damage to an enemy, you may gain temporary hitpoints equal to your wisdom modifier. While this ability is active, temporary hitpoints you possess can stack with each other. You fiercely defend your allies, willing to sacrifice your own health for theirs. Trigger: One ally is successfully hit with an attack. Effect: You may instead be the target of the attack's damage, absorbing the damage completely. Your a soldier who embarks on a grand, righteous Crusade. Trigger: You target a creature with an attack. Effect: You may target the will defense for the attack. You exude a bright light, allowing you to heal one creature. Effect: The target may spend a healing surge to regain hitpoints equal to their healing surge value. With your righteous shield, you shall defend the freedom of all those who need your assistance. By throwing your shield at the target, you can use it offensively to not only absorb the damage from attacks, but disrupt them. Trigger: An ally within 5 square of you is targeted with an attack. Requirement: You must be wielding a shield. Effect: As an immediate interrupt, you can roll your strength + weapon proficiency vs. the creature's AC. On a successful hit, the creature's attack is interrupted. You unleash your Holy Wrath on to all enemy's unfortunate to become your foe. Effect: You enter the "Holy Wrath" stance. While in the stance, you receive a -1 penalty all defenses, and gain a +1 bonus to all attack rolls and a +2 bonus to all damage rolls. Holy Avenger (Level 11): When you spend an action point, you gain temporary hitpoints equal to your wisdom modifier. Righteous Fury (Level 11): You gain a +1 bonus to all attack rolls using a weapon or implement. Divine Bulkwark (Level 16): Once per turn when you are struck with an attack, you gain temporary hitpoints equal to your wisdom modifier. You are blessed with the favor of the Light, which gives strength to your attacks. Hit: 3[W] + Strength. In addition, one ally within 5 squares of you can spend a healing surge. You are inspired by the power of avenging wrath, harkening your holy crusade. Effect: You gain temporary hitpoints equal to your healing surge value. While you have temporary hitpoints or until the end of the encounter, you gain a +1 bonus to all attack rolls. If you run out of temporary hitpoints, this effect ends, even if you gain more temporary hitpoints later in the encounter. You impart the verdict of a Templar, with the judgment of death. Secondary Attack: Strength Vs. AC. Tertiary Attack: Strength Vs. AC. Special: When wielding a melee weapon, you can treat it as a heavy Thrown, even if it does not ordinarily possess that property.